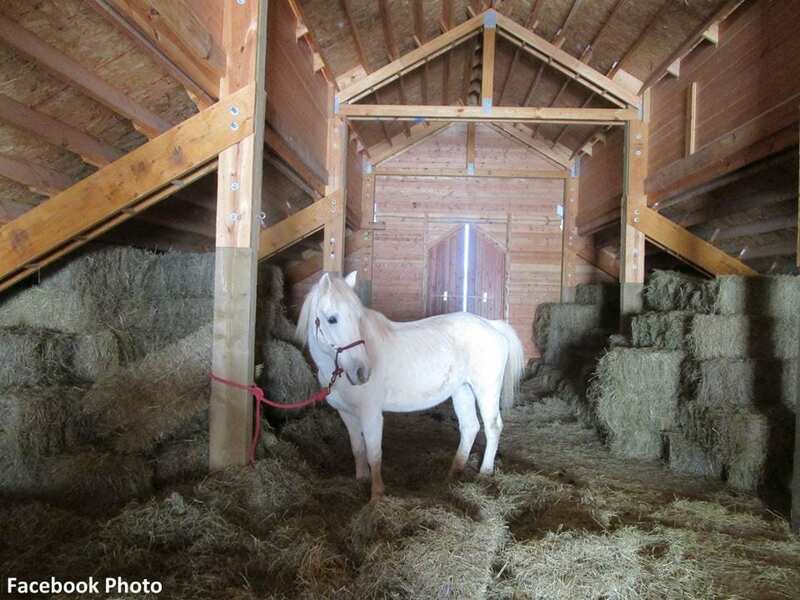 A 12-year-old mare followed her stomach into the hayloft of her barn in Virginia on Sunday night, according to fredericksburg.com, and like most horses was unable to negotiate the stairs back down to the ground. Holly's misadventure eventually culminated in a successful four-hour rescue by Culpeper County's Little Fork Volunteer Fire & Rescue Large Animal Rescue Team. The stairs to the hayloft were steeply sloped and added another layer of difficulty with a 90-degree turn in the middle. Rather than taking Holly down the stairs, the team of firefighters enlisted the help of neighbor Garrett Moyer and his telehandler boom to lift the mare off a porch at the front of the barn. “Holly seemed apprehensive when she was moved off the porch and found herself 20-feet off the ground, but she remained calm and was slowly lowered,” said Little Fork Fire Chief Doug Monaco. Resulting video and photographs of the mare's misadventure quickly went viral via the Large Animal Rescue Team's Facebook page. This entry was posted in Horse Care, NL Article and tagged Doug Monaco, facebook, hayloft, horse in the hayloft, large animal rescue team, Little Fork Volunteer Fire and Rescue, rescue, virginia by Paulick Report Staff. Bookmark the permalink.